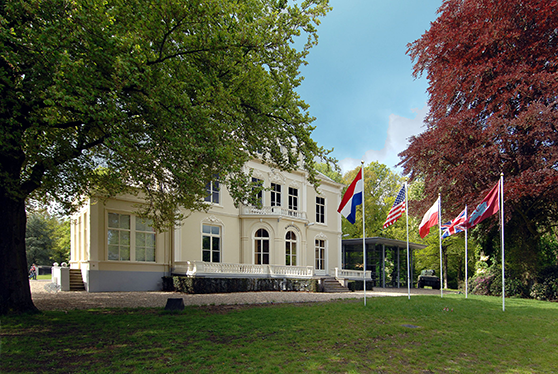 “Airborne Museum Hartenstein” is a battlefield museum about the Battle of Arnhem which took place during World War II. Housed in a listed nineteenth-century villa, it exhibits the world’s largest collection of militaria from the famous battle. The villa served as the headquarters of the British Airborne Division in September 1944, and heavy fighting took place in the forest surrounding the museum. As a result, numerous trees around the museum were impacted by bullets, and nowadays you can still see some of the ‘scars’ where bullets and other metal fragments pierced the tree in its younger years. The trees were still young when the bullets hit them and, over the course of roughly 70 years, the trunks have completely encapsulated the fragments. I find it fascinating that these trees have taken on the role of time capsules. The museum itself houses the world’ s largest collection of militaria from the Battle of Arnhem, but few visitors are aware of the physical remains of the battle in the now peaceful forest just outside the museum. 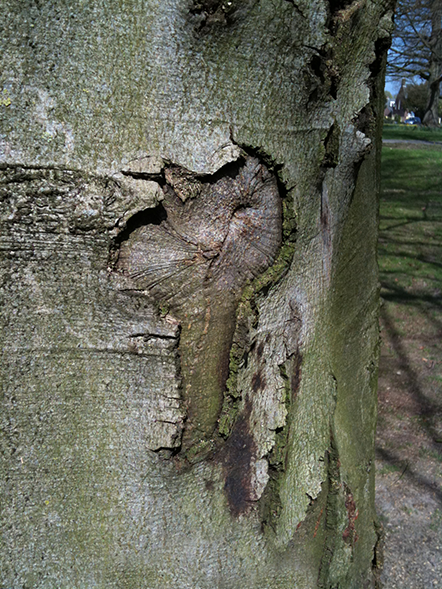 By disclosing the hidden content inside the trees we aim to extend the museum narrative to its surrounding space. I developed an augmented reality application which runs on smartphones and tablets. 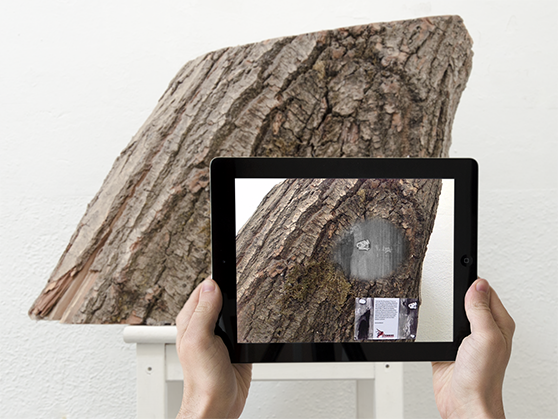 By pointing the device’s camera towards pre-selected trees, its screen shows an X-ray of the tree superimposed on the real tree, giving the illusion that you can look inside it. 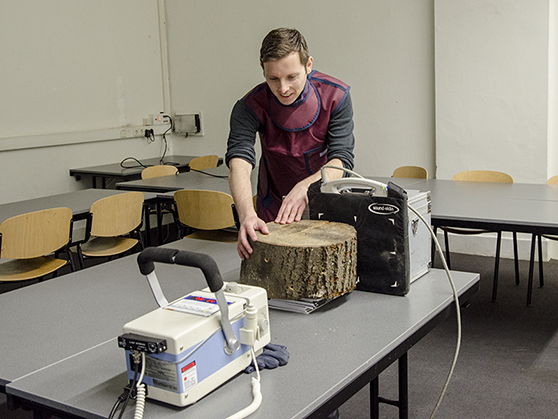 Because of the travelling distance between our institute and the museum, I chose to first develop a prototype at our lab using an ordinary piece of tree trunk. Obtaining a tree trunk was easy but obtaining a tree trunk with bullets inside was somewhat of a challenge. Since no trees around the museum were scheduled to be cut down, I had to find an alternative way to put bullets in our tree trunk. Members of “Defensie Schietvereniging”, a rifle club for employees of the Dutch Ministry of Defence, were willing to help us. They arranged genuine World War II weaponry from their depot (a Lee Enfield .303 rifle, M1 .30 carbine and Browning Hi-Power .9mm handgun) and fired multiple rounds at our tree trunk with genuine ammunition. 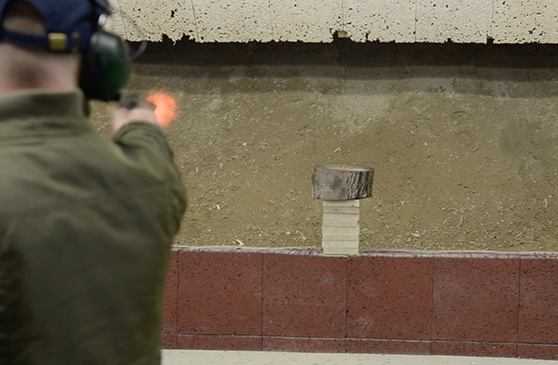 Scanning the bullets inside the tree trunk is another key element for the realization of our application. There are many stationary X-ray scanners on the market but only portable scanners are of use to us since eventually scanning should take place on location. While searching for a portable X-ray scanner, we came in contact with “Mijn Paardenarts”, a Dutch veterinarian who utilizes a portable X-ray scanner to examine horses on location. 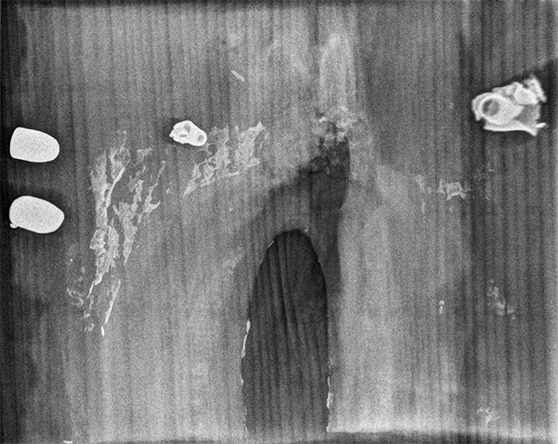 Fortunately, they were keen on helping us and at our institute we X-rayed our tree trunk from multiple angles. I merely expected the scans to display the bullets as white blobs on a black background but the quality of the scans was much better than expected. The bullets are easily identifiable and the structure of the tree itself is displayed with much detail so that even the tree-rings are clearly recognizable. With all necessary parts available I commenced building the augmented reality application itself. I chose augmented reality software Vuforia for development since it had proved its stability and ease of use during previous projects and smoothly runs on mobile devices. To position a virtual layer upon a physical object, the augmented reality software must be able to derive real world coordinates. Technically, it is possible to use the scars on the trees as augmented reality markers since they have unique shapes and are positioned at the location of the bullets. Nevertheless, a sign on the trees is needed to inform the public about the project. Using this sign as an augmented reality marker offers better tracking quality since it can be designed with the requirements of the software in mind. This project was presented at the 19th International Symposium on Electronic Art (ISEA2013).